At a special meeting of Down Council on Monday 12th December 2012 to discuss its policy on Mournes-based National Park, it considered a presentation from Tony Gates, Chief Executive, Northumberland National Park. Following the presentation a wide range of concerns were discussed by members present, especially concerning fears expressed at recent public meetings that the local population living in the park could be adversely affected by planning issues and farming practices might have to change. 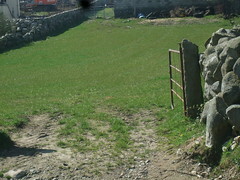 Tony Gates, a Tyrone man who has lived and worked in the Mournes area, explained that a National Park in the UK has no powers to compel farmers in any way, and in Northumberland the Parks Authority was instrumental in securing Environmental funding payments to farmers who wanted to support the work of the park on a voluntary basis. Following questioning on planning issues by Cllr Cadogan Enright, Tony Gates confirmed that under the 1949 Parks Act, National Parks could operate as a sub-committee of the Council for planning purposes. Cllr Enright said that this approach might ‘square the circle on the park between its supporters and detractors and ensure that the local populations interests are secured’. 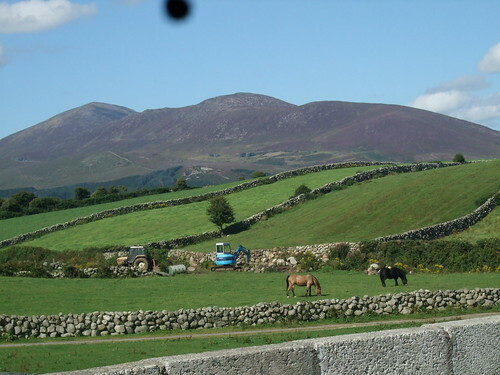 It was proposed by Cllr Eamonn O’Neill that Council management write to Minister Attwood restating the Councils support for the National Parks proposal for the Mournes area. 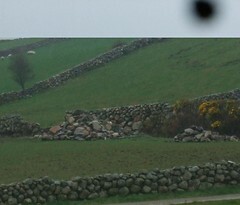 He accepted an amendment from Cllr Enright that the letter of support should firstly emphasise the idea of copying the English 1949 Act and ensure that the National Park operated as a sub-committee of the new ‘Super-Council’ and secondly, reflect the desire of the Irish Minister for the Environment and Louth County Council to have a cross-boarder “Euro-Park” approach to this project. While I highlighted these dangers, I also put forward solutions, many of which were adopted in the final report via my predecessor on council Bill Corry who was on the parks working group. Any remaining issues can easily be dealt with given the premise of local democratic control over the Park. The opportunity for local democratic control was enhanced last week by the publication of the new Electoral Boundaries for the New Down and Newry and Mourne Super-Council. This announcement reflected my submission seeking the transfer of Ballyward, Leitrim and Finnis into the new council are to ensure that the entire National Park will fall within one council area, potentially bound by local planning policy set by the new council. Having a Parks Authority under the new Super Council would avoid unelected bureaucrats over-ruling our local elected representatives on policy in the park, and would allow the new council-based planning system to set the rules for development in the parks area. 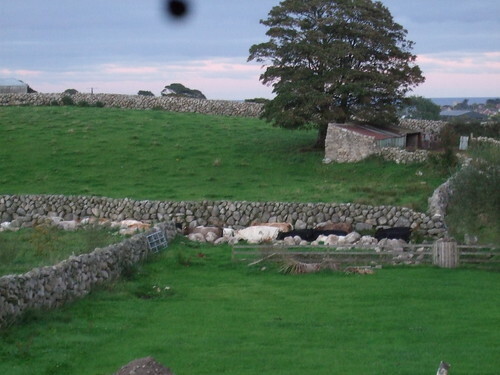 I believe that having the National Park run by a sub-committee of the new Council along with local community and farming representatives would avoid the dangers posed by external rule by a quango or by the Department of the Environment. We may also need representatives from Louth Council, as the Park should include the Cooleys. Most of the other concerns are of a simple practical nature like insurance for visitors on the land, compensation for maintaining the environment of the park and other details all of which have had solutions identified already. The President of the Newcastle Chamber of Commerce did not get a fair hearing at the meeting last week. Audrey Byrne speaks for all 7 Chambers of Commerce across South Down who have a joint manifesto on this issue. They represent 670 mostly indigenous small to medium sized enterprises, owned locally and with deep roots in the Mourne area. A National Park would be a local asset generating thousands of local jobs that could not me moved at the whim of a multinational company. The Killarney National Park area on its own has more tourists than the whole of Northern Ireland put together, this is an opportunity we cannot miss. Following Digital UK writing to Down District Council last year us last year on the schedule for switch-over, I wrote back to them to them seeking reassurance that widespread concern around Down District that RTE1, RTE2 and TG4 would be available from day one as had previously been announced and as agreed under the Good Friday and Saint Andrews Agreement. Very large numbers of people in this district rely on these stations for sports coverage, Irish Language broadcasting and news across the Island of Ireland. Worryingly, digitaluk’s team here in N.I. have confirmed that only one of the two transmitters in the Belfast area will be carrying the Irish as well as the UK stations. 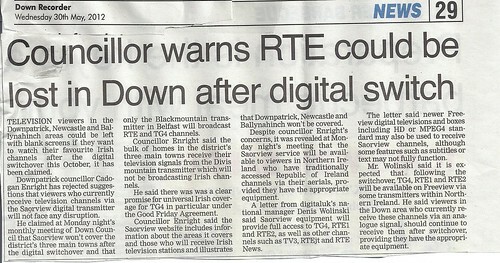 Blackmountain will have both, but the Divis transmitter will only have UK services – most TV’s in Down District receive their signal from the Divis Transmitter. I have challenged this arrangement both directly myself, and have had Down Council express concerns on behalf of all citizens in the District. I am campaigning to make sure we do not end up as part of the 7% who do not get the service. Councillor highlights RTE signal danger, a photo by CadoganEnright on Flickr. 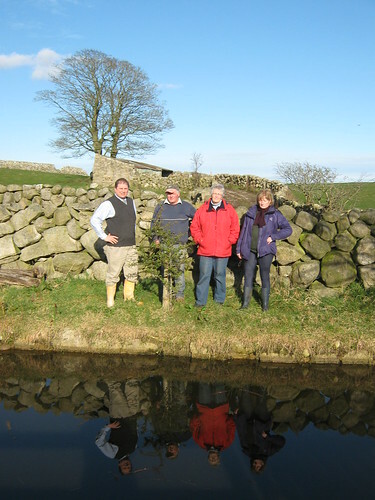 Photograph shows Cllr Enright standing with a local resident and members of Friends of the Earth beside the Annalong/Moneydaragh River. 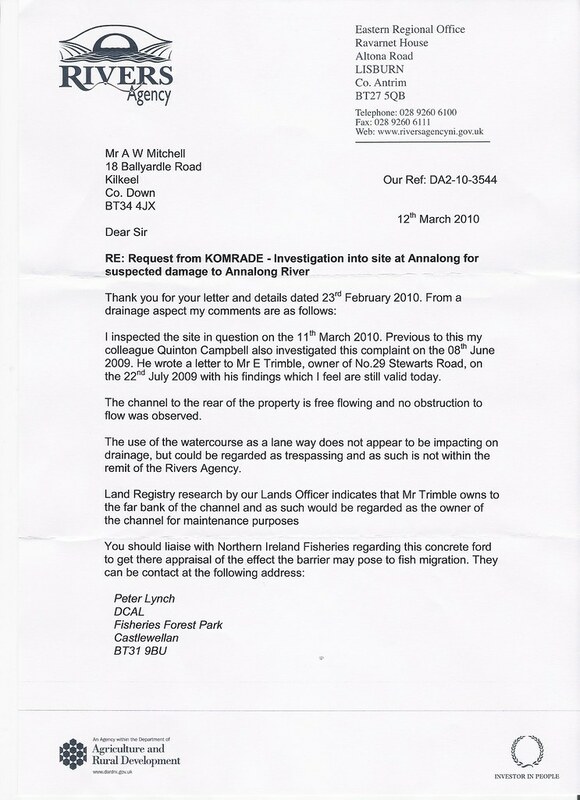 Local Residents and Fishermen have contacted the Green Party about the lack of action by the Inland Waterways & Fisheries department of DCAL in protecting the Annalong/Moneydaragh River. This river is one of the rivers in South Down that the Green Party wants to restore to its former glory as a salmon river, with all the economic, social and tourist benefits that that will entail for the local economy. 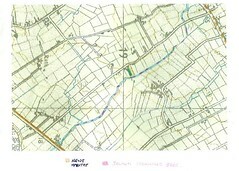 Below is a map drawn by a local resident showing in GREEN where the picture above was taken and setting the river in its context as a valuable habitat. Click on the map to see a larger size. Green Party Minister Eamon Ryan led the Green Party campaign for almost a decade to get drift net fishing abolished in the Republic. We succeeded in 2006 in banning drift-netting off the East and South coasts. This means that salmon will once again be able to reach more rivers in Co Down. However I was shocked and appalled at finding a salmon river being converted to a roadway for agricultural machinery with the gravel and banks being dug out for that purpose. In my years as a Green Party Councillor and Environmental Activist, I have tackled many environmental problems, but this tops the lot for me in bare-faced effrontery and confidence that the authorities in NI will take no action unless forced to do so. Here are recent pictures of agricultural machinery of all types using this river as a roadway, rather than choosing to use local roads like all other agricultural or other traffic. Click on these images to see photos of the river being used to move heavy machinery. It is a scandal that the Inland Waterways & Fisheries has not pursued this matter. 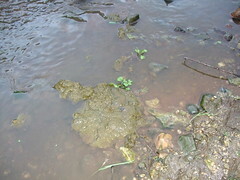 In my conversations with a representative of DCAL I was informed that this river was a small matter in the overall scheme of things and there was an attempt to dismiss the matter as a “neighbourly dispute”. It was only when I pointed out that the removal of banks and gravel from a salmon river was strictly against the law was there and agreement to go out and inspect this stretch of river again. Local residents have written to me saying how they witnessed the removal of the gravel and they have described how the fisheries agency took no action when complained to. Click here to see the salmon river bed which was dug up and piled in this field. I have written to the Chief Fisheries Officer of DCAL to protest this attitude and ask for an investigation into the lackadaisical approach to complaints from local landowners who own the riverbed and who do not want to be held responsible for this damage and have thus recorded it photographically to protect themselves. Click here to see the letter which Cllr Cadogan Enright sent to the Chief Fisheries Officer at DCAL. 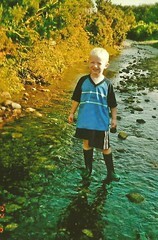 Click on these images to see photographs of were the salmon river was dug up. In addition there is dumping at or in the river, allegedly from the same source, and I have brought this matter to the attention of the local council and the Norhern Ireland Environmental Agency with a view to seeking prosecutions in this matter. The investigation number here is 7140. Click on the images to see dumping and debris in the river. Local fishermen have combined to draw the river on two maps below to show where the spawning beds used to be, and local people, supported by the Green Party want to see this river restored to its former glory. Click here for map 1, Click here for map 2. The Rivers Agency claim they have no issue here, as the river is still flowing freely and pass the problem back the Inland Waterways & Fisheries at DCAL. Click here to see copy of this correspondence. 1. We have supplied them with photographs of the large amount of gravel removed from the salmon beds and have witnesses prepared to testify to this. 2. That the banks of the river have been dug out for greater than one hundred meters to facilitate the use of the river a roadway for slurry tankers, combine harvesters, tractors and large numbers of cattle. The use of the bed of the river as a roadway has compacted the remaining gravel beds. I have also supplied you with photographs with date stamps of same and have witnesses who will attest. 3. The digging out of the banks also entailed the removal of the public right of way along the banks of the river, and I have contacted the council on this matter with a view to them taking action to restore the right of way along the river. 4. 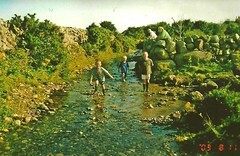 The traditional ford can still be used to cross without damage to the river. This would not add any length to the journey, but would entail using the public road to access the ford, rather than driving down the river to the ford. There has been no change in land ownership that prevent the use of the traditional ford. I have witnesses willing to attest that your staff are familiar with this point and that that the traditional ford has been used by the parties concerned up until last year. 5. THe local Fisheries Officer Mr Lynch has attempted to label the entire stretch of river as a ford to justify his lack of action, rather than the actual ford crossings marked on the maps and as were as traditionally used. As of the end of July 2010 we are awaiting an investigation by the Permanent Secretary. If she does not rectify this matter we will be going to the Civil Service Ombudsman. 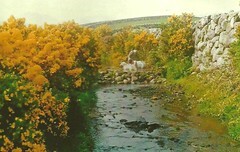 The phtotographs below, taken in 1994 and 2003, show the Moneydarragh River in its previous condition, with trees and bushes along the bank, pools along the river course and gravel beds. Local people got together to restore the banks and walkway along the river, the fish pools and weirs and attempted to reinstate the gravel beds that had been dug out, harrowed and flattened. Tests by Fisheries Agency personnel recorded a 500% increase in fish in the river. Is there an alternative route? Yes, with a long record of using the traditional ford as access with a photographic record stretching back to 1963. 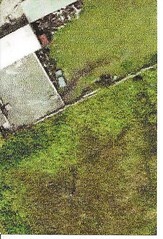 The picture to the left is an aerial survey from the Ordnance Survey showing the ford in use in 2004. The photograph to the right was taken in 2010 and likewise shows the traditional ford still in use. Photo below shows slurry being spread on a field immediately adjacent to the river at a gradient of greater than 20 degrees to the river and ignoring the 10 metre gap requirement. This information has also been sent to the Permanent Secretary. A fisheries officer was present while this was going on, and brings into question the ability of fisheries officers to properly police this river. The photo above also shows a digger being used to remove gravel from the river. A very substantial amount of gravel has been removed from the river on a number of occasions dating from 2001 by the polluter of the river and the photograph of the large piles of gravel is a substantial proportion of this gravel. I have letters from local people and landowners who witnessed the removal and who unsuccessfully complained to the fisheries agency. Additionally the banks of the river have been dug out for greater than one hundred meters to facilitate the use of the river a roadway for slurry tankers, combine harvesters, tractors and large numbers of cattle. The bed of the river has been compacted to enable it to be used as a roadway. The digging out of the banks also entailed the removal of the public right of way along the banks of the river, and I have contacted the council on this matter with a view to them taking action to restore the right of way along the river. It would now be impossible for anglers to use this stretch of river. One area of bank concreted and other stretches of the river have also been interfered with upstream of the area in question.. I believe that it is illegal for a river with protected species of salmon, sea trout and eels as well as brown salmon to have its gravel dug out, banks (including right of way) dug out, weirs and pools harrowed and flattened. One or two individuals in the Fisheries Agency seems to disagree, however it is clear that there are some in the Fisheries Agency who would prosecute if not prevented from doing so. We have sent off copies of the above photographs to the Head of Fisheries, and to Rosalie Flanagan, Permanent Secretary at DARD, as additional information for their long awaited internal inquiry. If prosecutions are not brought forward in light of the above evidence we intend to go to the civil service ombudsman alleging mal-administration on behalf of the Permanent Secretary. It also contains an image of cows walking in a river and labeling this as Water Pollution. – Click on the images to see larger view. The manures from the cows will cause pollution as stated in the DEFRA document and the sheer number of cows being herded will cause much damage to biodiversity in the river.